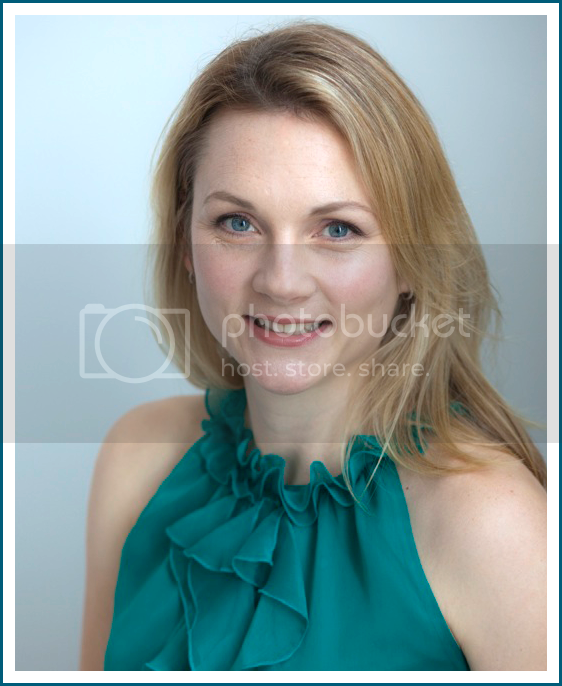 I am excited to share today's post with you. I finally spent some time on Big's room by decorating it and making it special for him. Decorating the kids' rooms was part of my new years resolutions. Big's room had a good start. 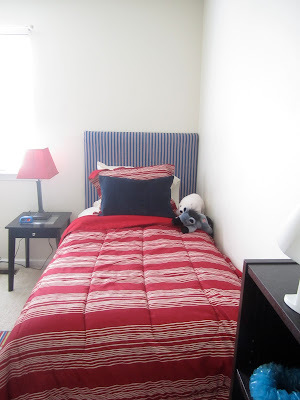 Last year he picked out the red bedding. It wasn't necessarily my choice, but it's not my room. 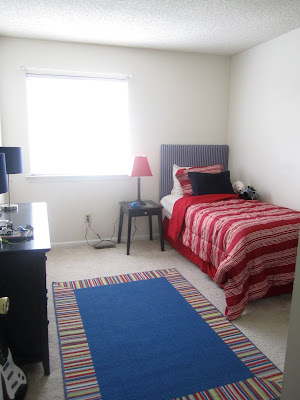 I had the rug already from his way old toddler room at the old house. I made the upholstered headboard and window valence to coordinate. 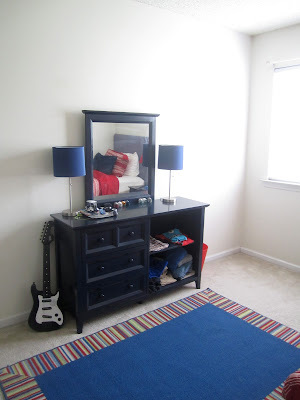 And the navy blue dresser was also from his room in the old house - it was a great find on Overstock and was part of a set of child's furniture. I've known since I moved in that it was a temporary solution: his clothes, at age 7, are just too big for the drawers. I ordered Big a new dresser from Raymour and Flanigan. I was tempted to go the IKEA route, and probably would have, but I could not lift the boxes of unassembled furniture! I decided to spend a little more and have someone else handle delivery and assembly. Here is Big's new dresser. I was able to use the navy shaded lamps again. And I brought in a mirror from Target ($40) and really fun star lamps from IKEA that I had been saving for awhile. I mounted them to the wall and just used a cord cover to hide the cords. The stars are connected to the light switch, so we don't have to worry about turning them off and on through the cords. Next to the dresser, I hung two prints that were also in his old toddler room. I found these in the clearance section of Home Goods years ago. I think they were $5 each. Obviously, the trucks would not do. Big is really into football, so I asked him what his favorite teams are. 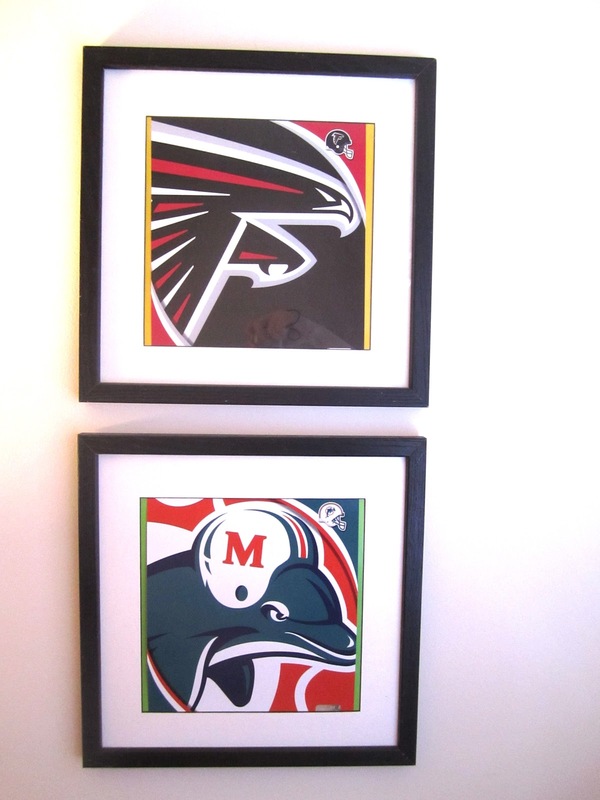 Miami Dolphins and Atlanta Falcons. So I ordered 8x10 posters of those teams' logos from allposters.com. I just used the frame and mats from the old truck prints. I think they turned out pretty good - only I hit a snag and accidentally broke the glass in one of the frames. Argh. I ordered some plexi-glass to replace it, and will pop that into place soon. 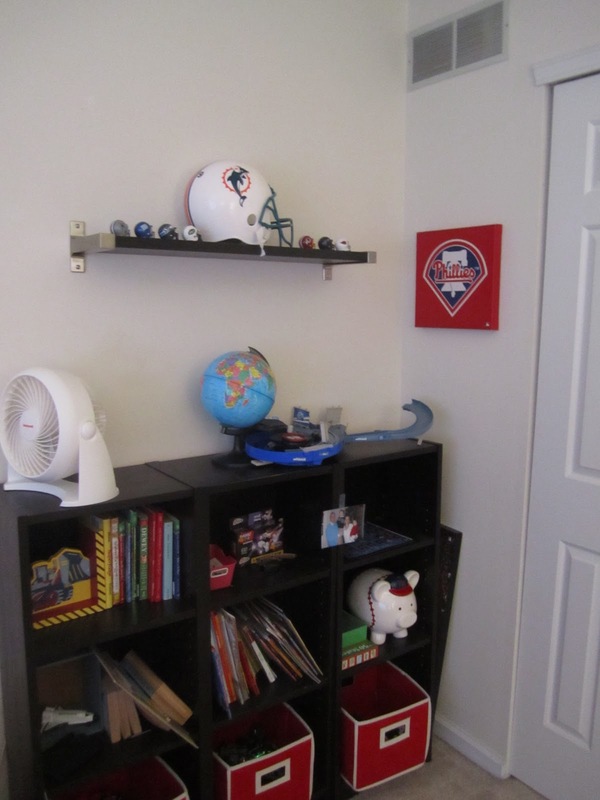 Over his bookshelves (also from IKEA and also purchased years ago when I redid his toddler room), I hung a wall shelf. He asked if he could put his football helmets on display up there. I think it looks good! We found this Phillies canvas at Target and he really wanted it. I picked it up - hometown team and it matches the room. There is more to do. His nightstand is only temporary. I found that table on clearance at Target a few years ago (I think it was $20). I am going to give him the IKEA Rast chest that is currently in my room and have that be his nightstand. I am going to do a two-toned treatment to it: paint the drawers white and stain the outsides to match his dresser. It will give him more storage and hide those pesky cords. I have more art to hang. 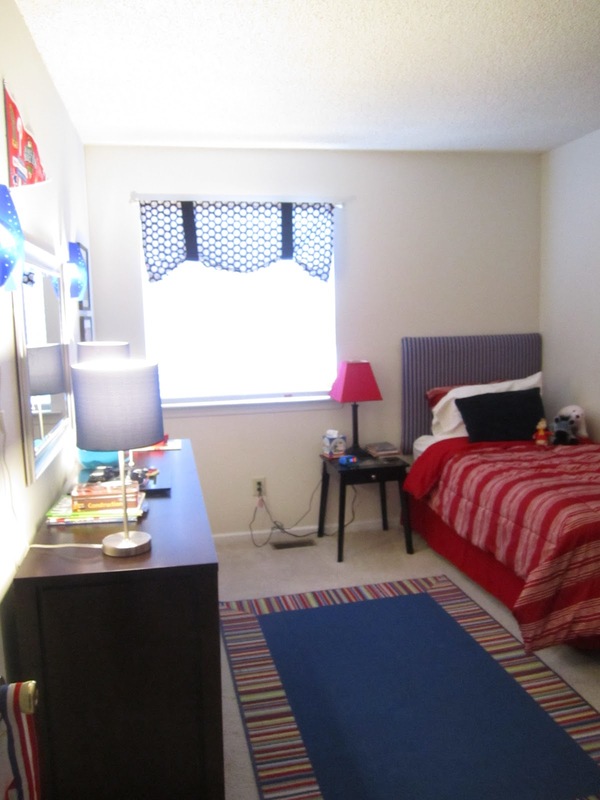 He has a paroramic picture of the Phillies stadium that I think I will hang over his headboard. He has a poster that he wants to hang too, so I need to grab a poster frame for that. And finally, the cherry on top of the room is a space mobile that we have been working on for a very long time. It's almost done! Just a few more pieces and we will hang over the bed. Oh, and the closet. That needs some help. It feels soooooo good to have his room underway. And now I should turn my attention to little miss Little's room. I need to hang a lot on the walls, bring in a rug, increase the lighting, hang a shelf and find a piece of furniture. Yay.